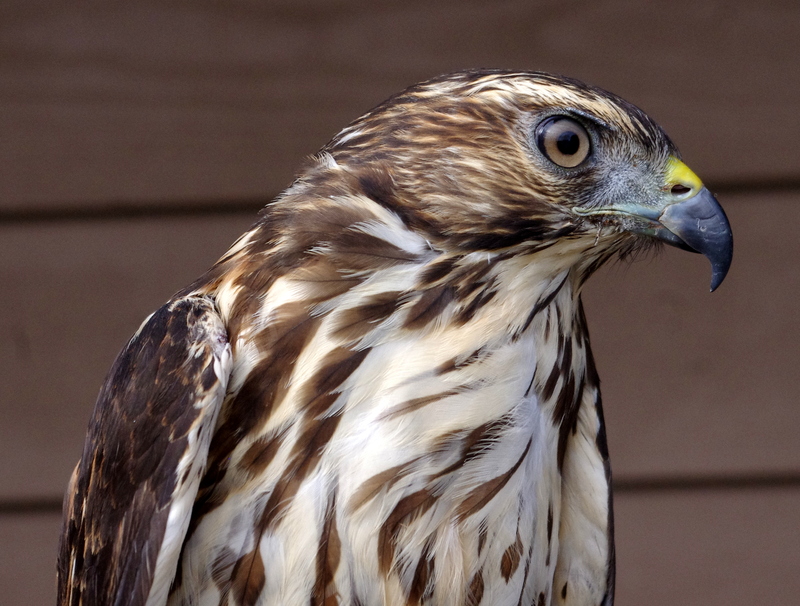 Nothing excites our visitors more than seeing raptors up close and personal. 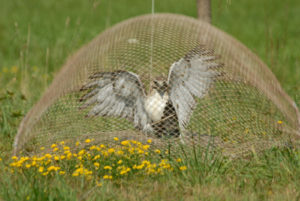 There are many ways to do that at Braddock Bay, from the hawkwatch to the banding station to the Owl Woods. Encountering wild raptors in their natural habitat is surely a thrill. Just as thrilling is getting to see these birds even more closely, in a way that helps people really connect with the species. 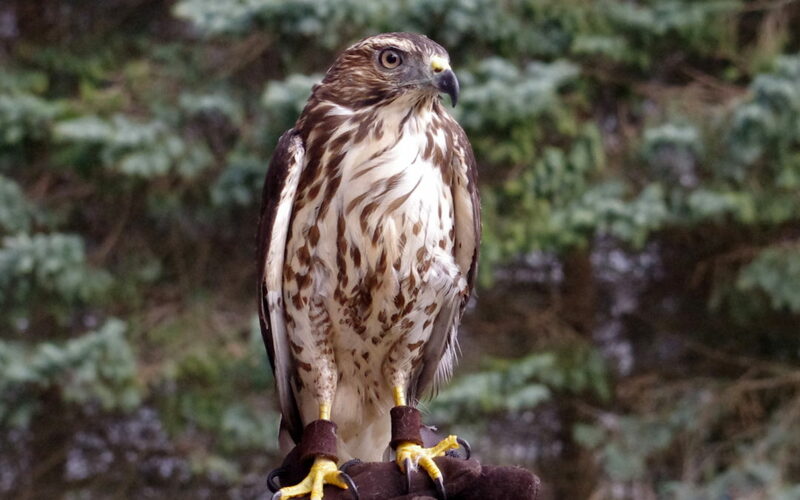 BBRR is excited to announce the arrival of a new ambassador for the organization – this non-releasable Broad-winged Hawk. 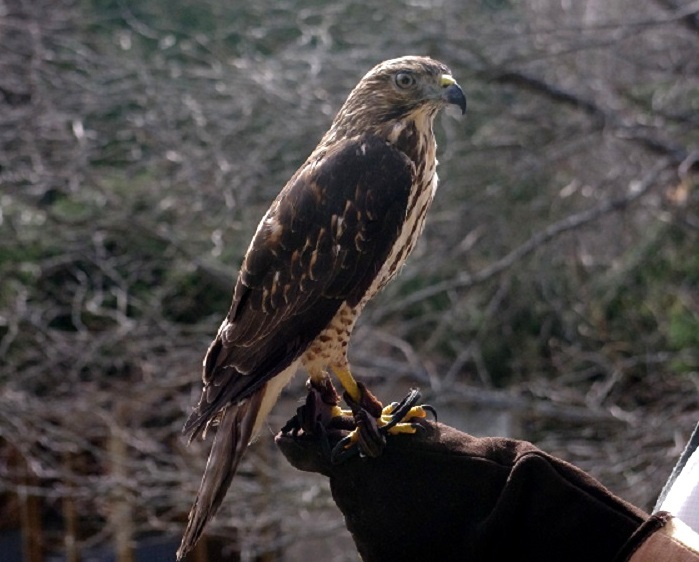 The Broad-wing comes to us from Kindred Kingdoms Wildlife Rehabilitation Center, north of Syracuse, NY. 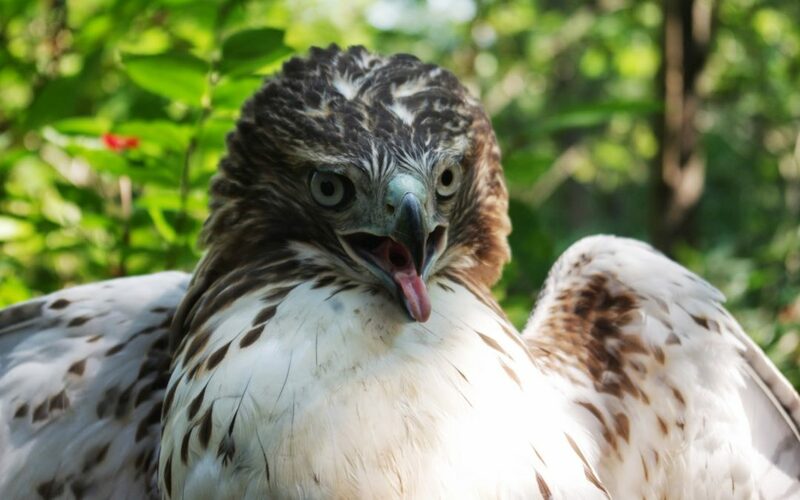 He came into the care of wildlife rehabilitator Jean Soprano after he was hit by a car near Watertown, NY. Unfortunately he sustained injuries that would prevent his release back to the wild. He is now missing his left eye and also has some permanent damage to one wing. Despite these injuries, he is quite a beautiful bird, and has a very charming personality, making him a good candidate for educational use. 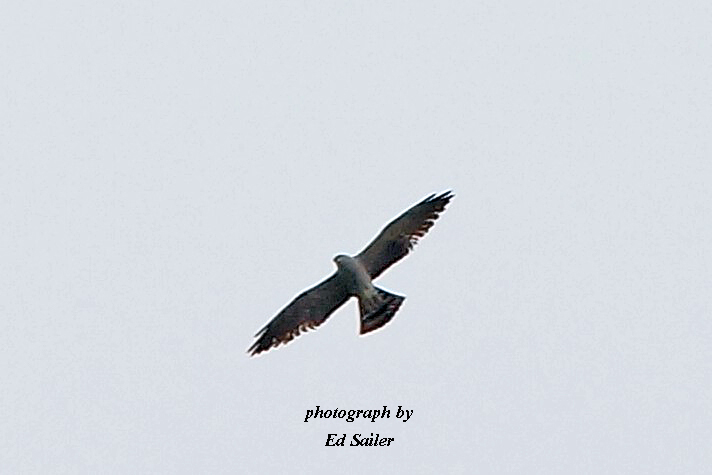 The Broad-wing is a juvenile, hatched sometime last summer, so he is sporting the plumage of a youngster right now. 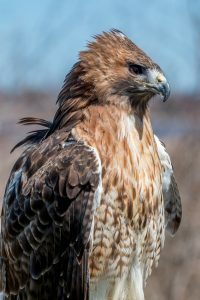 He will molt into his adult plumage this coming summer, which will give him that diagnostic wide white tail band, and his streaky chest will change to one with rufous colored barring. 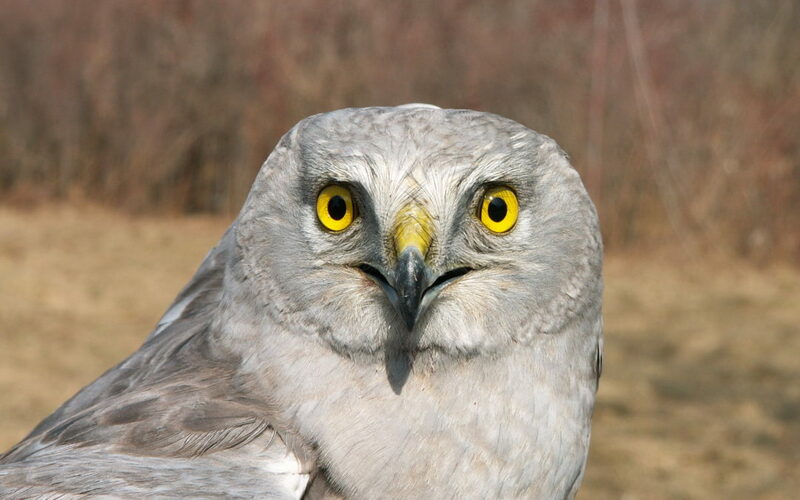 It is believed that he is a male due to his size being on the lower end of the spectrum, and males tend to be smaller than females in the raptor world. After only a couple of months in his new BBRR home, the Broad-wing has proved he is ready to go out into the world and take on his new job as an education bird. He recently made his first appearance at a local Brownie Troop meeting. The girls were learning about backyard birds and had plans to create some homemade bird feeders. They were the perfect audience to start the Broad-wing out on his new career, as he showed he was very comfortable in his unfamiliar surroundings. 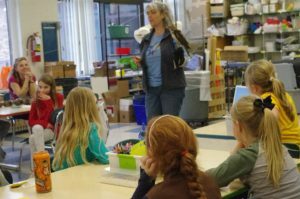 Daena Ford presents the Broad-winged Hawk to some Brownies from Honeoye Falls. 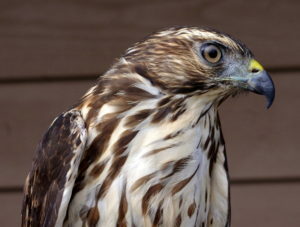 BBRR’s Broad-winged Hawk is the first addition to the new education bird program we are calling Raptor Connections. 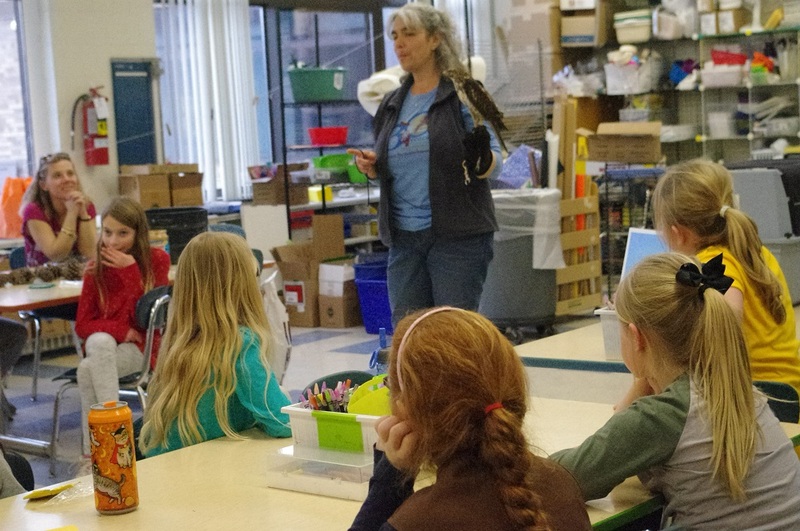 The goal is to add 3 more birds to the collection, all of which will be program birds, available for outreach and other educational appearances. Stay tuned for updates as we acquire new birds. If you would like to schedule a Raptor Connections program with our Broad-winged Hawk (and other birds in the future), contact Daena Ford at information@bbrr.org or 585-267-5483. Braddock Bay fans often enter into the month of May lamenting that the hawkwatching season has past its peak, and it’s all downhill in terms of raptor migration at least. It doesn’t help that our eyes are easily turned to the colorful menagerie of warblers and other songbirds that make their way along the lakeshore, too. 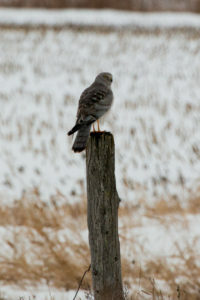 Warblering is a nice distraction on days when hawks are just not cooperating (and sometimes when they are.) 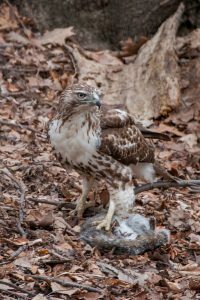 While it is true that the season’s end is closer at this point, it is far from over and there can be plenty of exciting raptor moments left to be had as the days get longer and the temperatures warm (for the most part!). The raptor gods seemed to smile on us early in the month, or take pity on us perhaps, for even on a few days with Northeast winds, we still had some decent flights. 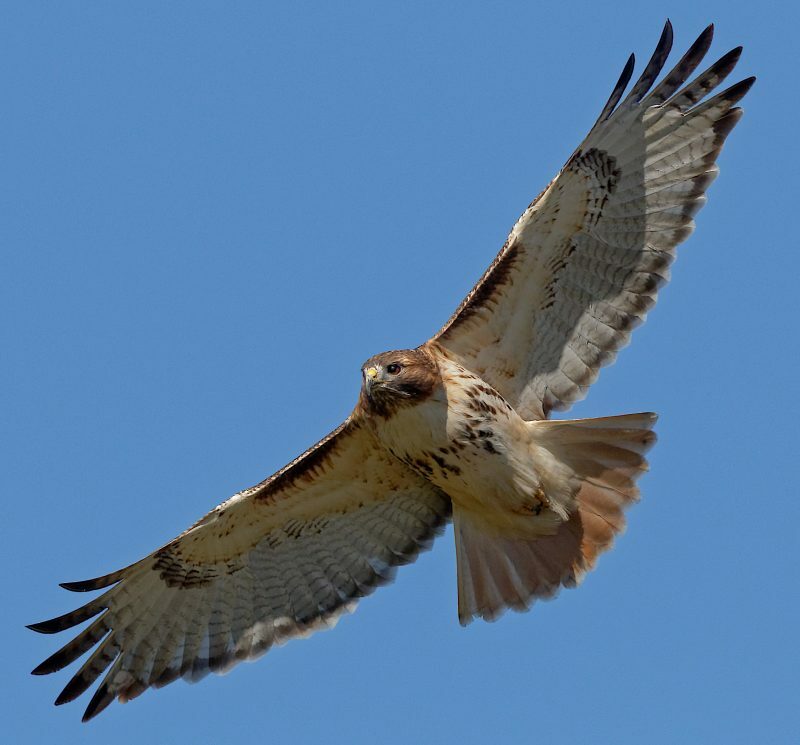 Take May 3 for example, when over 6,000 Broad-winged Hawks filtered through, and 52 Bald Eagles as well! http://hawkcount.org/day_summary.php?rsite=353&ryear=2016&rmonth=05&rday=03 A little over 2,000 Sharp-shinned Hawks were also tallied in May, which is almost half of the season total. Speaking of Sharpies, the banding stations had some great days in May, reminiscent of the good ol’ “Sharpie Madness” days. 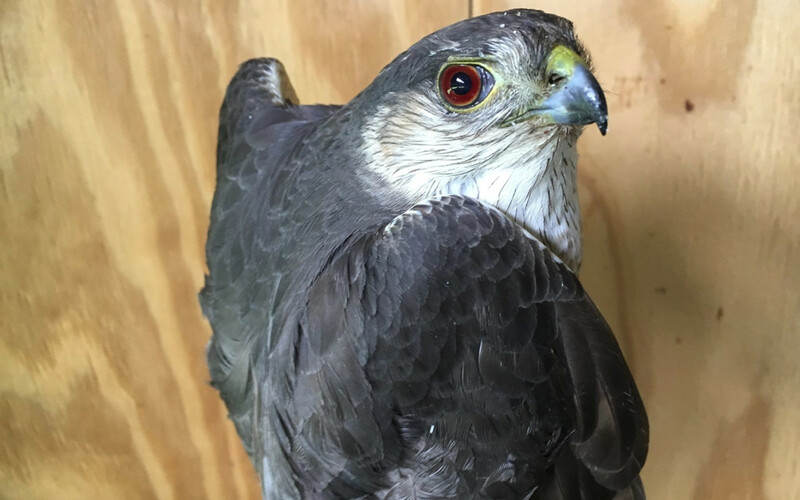 Over 150 Sharp-shinned Hawks were banded just during the month of May, and mainly over the course of just a few days. A nice variety of adults and immatures, males and females were captured. 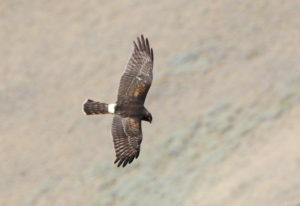 One of them is pictured above – a gorgeous adult female that was banded and photographed by Barbara French. Two season records were also reached at the hawkwatch in 2016. 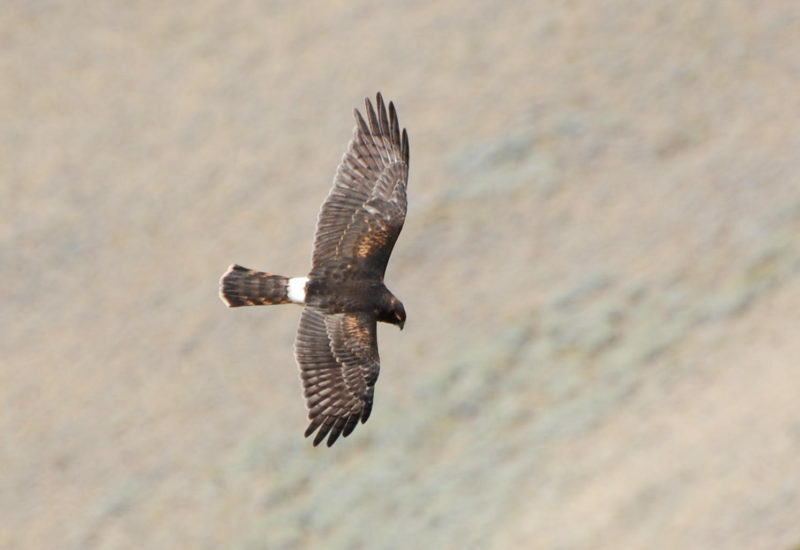 First, we had a record number of Peregrine Falcons with 51 for the season! The previous season record was 45 back in 2004. Thanks to the extra efforts of counter Ryan MacLean, we also tallied up a new season record for Bald Eagles which ended up being 664 for the season! The previous record was 648 counted by Luke Tiller in 2013. 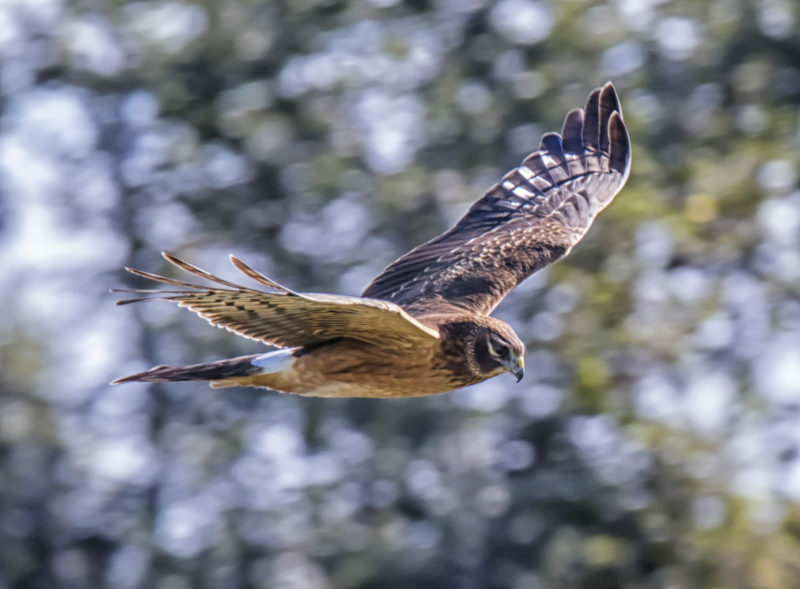 To think back to the early days when the hawk counts were just beginning, in the late 1970’s and 1980’s we were lucky to see a couple dozen of these magnificent birds. 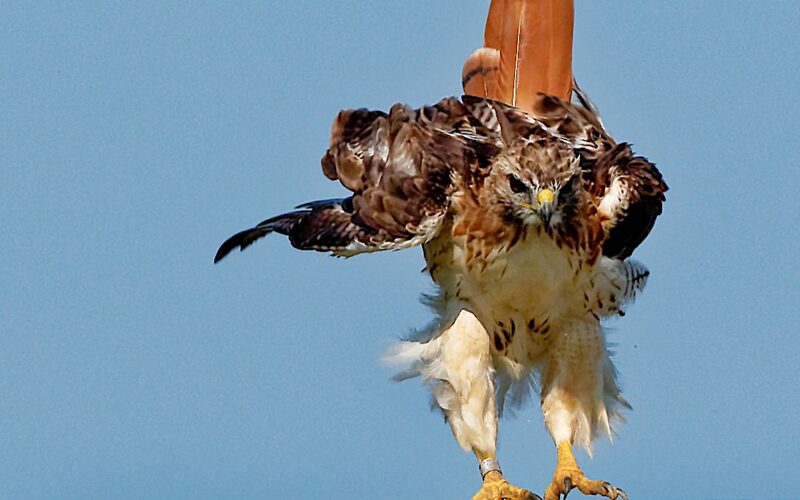 Their comeback is truly a conservation success story.